Before I see a honeybee in the lavender, I hear her. She says two things. The first makes my heart sing because she proclaims the buds are blooming and ripe for harvest. A bit impatient, it’s my habit to hunt the first blossoming stems to cut and bundle before a bee arrives. 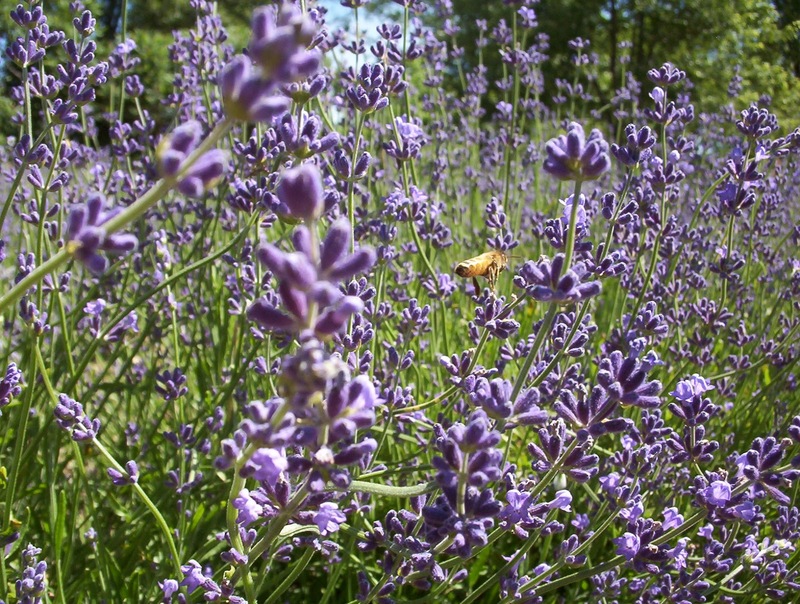 There’s nothing like lavandula angustifolia to scent a room and linen closet. And with the deer consuming most my lilies, hollyhocks, and phlox, I’m ravenous for color and fragrance this summer. The sun was high, the air sweet and calm when I strolled into the fields a few weeks ago, albeit preoccupied with my maiden kayak voyage that morning. I clipped in solitary serenity, surprised and satisfied I didn’t tip my friend’s boat and soak myself. Hour after hour, the buds flowered before my eyes. Then, without a reservation, a bee flew in and landed beside me. She said her second thing. The year is half spent. Make most of every day. That wee, wise worker bee knows of what she speaks. Her lifespan is about two weeks in summer, several months during winter. Unlike me, her genetic sense of urgency and duty allows no distraction. She went to business, one shrub to another, proboscis deep into corollas. The bee’s second message usually makes my heart sink with a mental inventory of what I’ve yet to accomplish for the year’s goals. Yet, as Eliza Doolittle sang, that loverly feeling of “sit’n ab-sa-bloom-a-lute-ly still” in a kayak and lavender field held firm. Truly, there was no better way to make the most of a summer day. What irony. Kayaking wasn’t a goal, not even on my bucket list. The opportunity came by invitation. Now I’m looking for an inflatable kayak thanks to another friend who also appreciates the peaceful movement of paddling on calm water. Serendipity. Blessed relief from rigid goals. As I counted my blessings and lavender bundles, the bee’s solo swelled into a choir of thousands, the Apis mellifera’s rendition of Ode to Joy, I believe. A few independent girls followed my baskets under the pergola where I bundled the wands in shade. The bees sang their solos and said good-bye until the morrow. Could life be any sweeter? Certainly. Like bees, people are also drawn to lavender’s goodness. So I harvested and bundled healing beauty for folk I’ll never know, casted my bread upon the water at the Farmington Farmers Market and Papa Joe’s. Dear Reader, now, more than ever, I listen to the honeybee. Her voice is consistent, trustworthy. My life is way past half spent and there is much work to accomplish. Land to reclaim to native grasses. Books to publish. Family, friends, and neighbors to love and hold. A metaphor of the human spirit, the lavender harvest is plentiful this summer. I cannot possibly bring it all in. And that is good, for the bees need a pure source of pollen and nectar. They shall have it, lest I forget what the honeybee says.